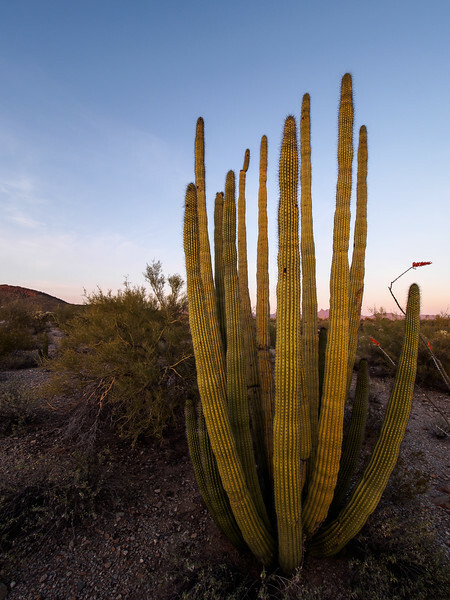 March 14th to 16th, 2016: Organ Pipe Cactus National Monument lies on the southern border of Arizona, just outside of Mexico, and protects one of the northernmost habitats of the Organ Pipe Cactus. We arrived mid-day Monday after an eventful drive with Matthew getting sick a couple of times. After setting up camp we toured the visitor center and Brandon started on his Junior Ranger studies. Dinner was early this evening so we could then explore the Ajo (A-ho) mountain drive which passes a large grouping of Saguaros, climbs over a pass, then drops into a valley and runs along the base of the Ajo’s before winding back toward the main highway. Along the way we stopped often for pictures and a nice desert sunset. Early the next morning, I walked away from the campground for a photo of the Milky Way, then ventured out again closer to sunrise to capture the dawn over the remote desert. During the day we drove to Quitobaquito Springs, in the section of park that until 2014, had been closed due to border security issues. Seeing the ‘fence’ it’s no surprise that a lot of people came through the park! Once we got back to camp Brandon finished his Jr. Ranger book and received his badge, and we relaxed until evening approached, where I set out on foot over a nearby ridge for some photos before joining the rest of the family at a stars talk presented by the park service. Overnight was eventful as Matthew got sick again, so we had to rinse him, and his sleeping bag off at around 1am! To wrap up the trip, I captured some more Milky Way photos before sunrise on Wednesday, and after that we packed up and headed back home for the rest of our week off.